The Martin Pro-2 Portfolio series is constructed of Polypropylene, not recycled cardboard as many portfolios in the market today. Pro-2 offers an incomparable value for student or professional. The interior is built with one side with a pocket and the other side with an elastic restraining strap. 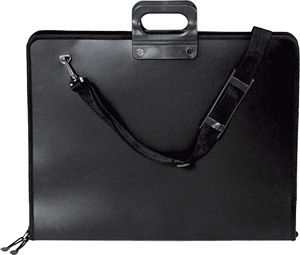 Size: 20x26x 1.5 inch Complete with adjustable shoulder strap. (Art supplies not included).